Can President Macron save the EU as a legitimate liberal institution, through a deliberate re-politicisation of European politics? What he attempts also has the potential to destroy it. 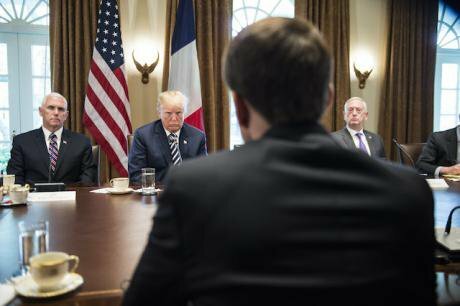 US President Donald Trump speaks with French President Emmanuel Macron during a meeting at White House, Washington DC on April 25, 2018. Blondet Eliot/Press Association. All rights reserved. Michael Sandel puts his finger on the key problem of recent liberal politics – that liberals, enamoured of technocracy and tolerance have lost their “capacity to inspire” and their power to persuade. He compellingly argues that Barack Obama was initially inspiring in word but less so in deed, falling back too easily on technocratic and neoliberal policies and, like other liberals of recent vintage, avoiding engaging in substantive moral arguments. Sandel is not alone in having reached the conclusion that this brand of liberalism has run its course and that if liberal politics is to again inspire and wield influence then it needs fresh “identity, meaning and purpose”. A new approach is needed. French President Emmanuel Macron has already gone far beyond “liberal neutrality” and has taken liberalism on the offensive. In doing so he addresses the concerns of Sandel and others by providing an inspiring and positive vision, and fosters patriotism and community – but at the European rather than the national level. Some have dismissed Macron as just another centrist, too moderate to make the changes needed to address Europe’s structural problems or as a typical neoliberal, a former investment banker looking after the interests of his ‘own class’. In short, another Obama waiting to happen. But Macron may be a different kind of liberal, an Offensive Liberal. He may not be the ‘leader of the free world’, but he’s currently its best hope – and the one who has opened a Pandora’s box in Europe. The award of the Charlemagne prize recognises the hope vested in him as the saviour of the EU, but his brand of politics could break rather than make Europe’s liberal future. The term ‘offensive liberal’, which may also appeal to Macron critics on both left and right, has been used before of course, to describe those such as Tony Blair or Anne-Marie Slaughter who have sought to promote democracy by force. But Macron’s offensive liberalism is different as his recent speeches to the US Congress, the European Parliament and, earlier, at the Sorbonne have shown. This new breed of offensive liberalism amounts to a deliberate re-politicisation of European politics, one that is aimed at saving the EU as a legitimate liberal institution – but which also has the potential to destroy it. So far, so centrist – even ‘radical centrist’, perhaps – but Macron’s brand of liberalism is also ‘offensive’ in two key ways that set it apart from other recent liberal politics. First, Macron has called for a revival of ‘political heroism’ and ‘grand narratives’, as well as outlining his own positive vision for a liberal Europe that combines sovereignty, unity and democracy in a ‘European Dream’. This positive approach sharply contrasts with the hesitant, sometimes apologetic, ‘defensive’ liberal positions of the ‘Remain’ and Clinton campaigns in the 2016 Brexit Referendum and US Presidential election. Rather than outline their own positive visions, these defensive liberals generally focused on what could be lost if their opponents won, while acknowledging (some of) their own flaws and the need for reform. This hesitant, negative approach, reliant on the politics of fear rather than hope, stasis rather than change, was never likely to inspire. The ‘Leave’ and Trump campaigns came across as more assertive, more able to understand widespread discontent but also, crucially, to narrate a clear vision of what should be done about it. Defensive liberals were left nervously clinging to past gains, which many people felt they had not sufficiently shared in, rather than offering a positive vision for the future. As The Economist and others, including Sandel, have noted, liberalism without hope, without the promise of a positive future, is liberalism in trouble. As The Economist and others have noted, liberalism without hope, without the promise of a positive future, is liberalism in trouble. Macron has also shown himself to be offensive liberal in another way – by carrying the fight directly to the opposition and actively seeking confrontation, conflict and controversy. This puts him at odds with the dominant neoliberal approach of recent years – ‘there is no alternative’ (or at least not any worth countenancing as a serious political contender) – that Habermas has characterised “day-to-day” centrism – and others have seen as showing that neoliberalism has run out of intellectual steam. Hence the approach that often sought to impose neoliberalising measures by stealth or in the wake of what some have seen as manufactured crises. This may have been offensive and humiliating for many people in effect but it was not offensive in its method, seeking to delegitimise opponents through non-engagement, letting the kids have their political tantrums and protest politics, while the ‘adults’ got on with the serious business of business as usual. Macron’s offensive liberalism is confrontational and conflictual but, despite the rhetoric, it is not warlike. With reference to Clausewitz’ famous dictum (and Foucault’s inversion of it) it is firmly within the realm and takes the means of politics, even if it remains comparable. And that’s the point: offensive liberalism is, in effect, the re-politicisation of liberalism in Europe and at the European level. If followed through, this will have potentially seismic consequences for the EU. Re-politicizing liberalism means breaking out of the paradigm that has held sway in European politics for most of the last three decades – the historicist liberalism that came dressed as the ‘end of history’. Many have repudiated Fukuyama and he himself has rowed back from the claims made in the heady days of the early 90s about the inevitability of liberalism’s ultimate triumph. In practice, however, much of the West and particularly the EU and its member states, acted to cement liberalism’s place at the heart of the their institutions. The EU came to be styled as ‘fundamentally’ liberal, with legally enshrined (liberal) ‘European values’ and ‘fundamental rights’. Making these things fundamental or constitutional effectively put them beyond contestation, off limits for discussion, to depoliticise them. This depoliticization has, in part, provoked the ‘illiberal’ challenge posed to the EU most obviously, but not exclusively, by the approach of the current Hungarian and Polish governments and by the Brexit vote. By and large the challenge has been met with intransigence, with EU officials and member states led by Merkel’s Germany, dogmatically repeating the mantra that the EU is a liberal club and refusing to sanction any potential treaty change or serous discussion of the ‘fundamental’ nature of certain rights and values, lest it give the illiberal camp an institutional foothold. Macron has recognised that this further – and potentially fatally – delegitimises the EU as democratic institution, as well as contradicting its own liberal values. So Macron has taken the third of his three options outlined above and gone on the attack, offending many to his left and right in the process, but also explicitly stating that treaty change is no longer a taboo. He has picked the fight for Europe’s liberal future, which carries with it the risk of creating an illiberal EU, or even the collapse of the Union. Macron and the offensive liberals must now win the fight they have picked. But if the offensive liberals win, it also carries the promise of a more legitimate, and lastingly liberal Europe. This is a prize worth having but, having gone on the attack, Macron and the offensive liberals must now win the fight they have picked. They will have to show that as well as reviving hope, and articulating a positive vision, they can also address the substantive problems identified by Sandel: income inequality, meritocratic hubris and destructive understandings of patriotism and community – and do so without compromising their liberal values.